The CradlePoint MC100E-VZ has been discontinued. No direct replacement is available. The MC100E-VZ is designed to be securely attached to compatible CradlePoint routers to create an "embedded solution". 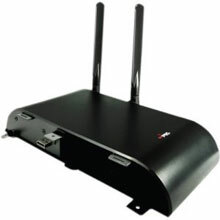 With a different form factor and permanent attachment to the router, the modem deters removal and theft by unauthorized users. As carriers begin to offer custom M2M metered data plans, this solution enables carriers and customers to utilize those data plans in remote, lights-out locations without fear of unauthorized usage or data plan abuse. Business grade radio modem, 3G EVDO Verizon. Requires compatible CradlePoint router or adapter (Part# CBA750) / (Part# MBR1400), Active 3G (EVDO) Subscription from Verizon.